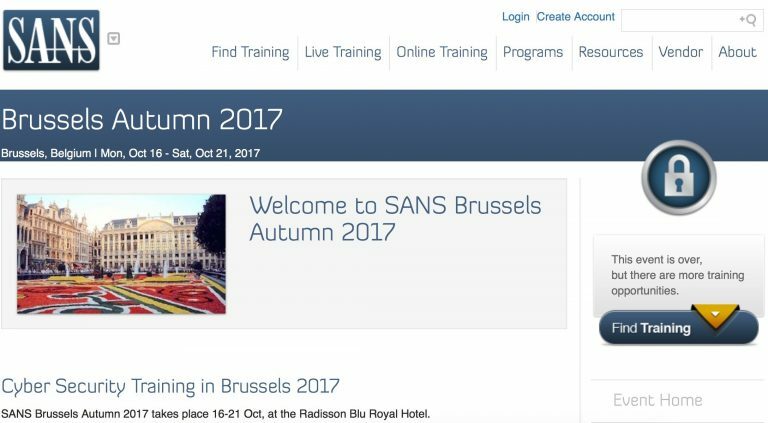 Last week I got the opportunity to participate in the SANS 560 ‘Network Penetration Testing and Ethical Hacking’-course at the ‘SANS Brussels Autumn 2017’ event from 16 to 21 October. During the five-day training I have learned a lot about the different procedures, techniques, tools, vulnerabilities, and possible exploits. On the sixth day of the course I participated in the Capture The Flag (CTF) event to take a shot at earning a SANS-coin. During this CTF I had to use all that I’ve learned in the previous days to compromise the different target-systems. Even though I didn’t earn a coin during the CTF it was a great learning experience and asome day! During the next months I will continue to study the course materials, and get the necessary hands-on to prepare myself for the GIAC GPEN exam. Jeff McJunkin For an asome week as instructor of the SANS560 course. Steve Armstrong | For a great tech-talk to remember about ‘Advanced Incident Response Techniques’.